The last release for Flintloque and Slaughterloo for 2016 from Alternative Armies is a character set sculpted by Christian Cuello unlike anything else in the whole range. 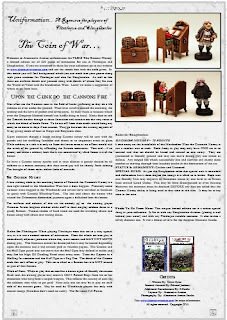 Limited to two hundred and fifty numbered packs with insert this new pack contains both miniatures and furniture in 28mm scale. 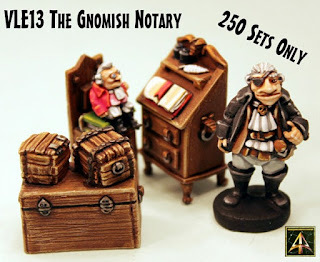 A Gnomish Notary with his Half Ogre guard as well as the writing desk and a chair before it and a chest with two boxes. A very unique and useful set. Go HERE or read on for more information. 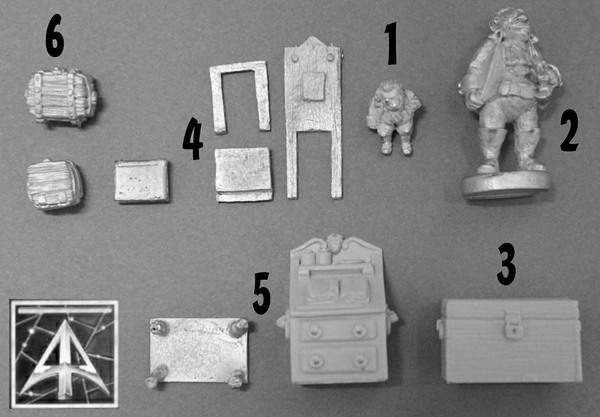 This thirteen pack contains figures and furniture in a mix of white metal and resin 28mm scale pieces. Limited to two hundred and fifty numbered packs with insert this set was sculpted by Christian Cuello. This pack contains a Gnome in sitting position along with a thick book and a chair upon which to sit, along with a writing desk in two pieces as well as a travelling chest and two small boxes; lastly a Half Ogre guard with pistol. The set requires a small amount of assembly and pieces can be established using our image of parts as given. 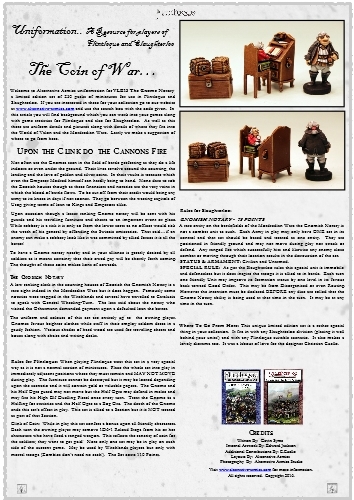 The insert supplied can be had as a free PDF from our dropbox HERE and gives rules for use in Flintloque and Slaughterloo. A unique and characterful set useful in any collection. 12.00GBP. Go HERE. Above is an image of all the parts in the set and it is very easy to assemble. You can base it up as single pieces or create a vignette or diorama. A free PDF is in our Dropbox for this set is online. 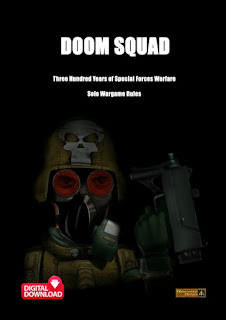 It contains rules and statistics for use in Flintloque and Slaughterloo. CLICK HERE. Enjoy! Christian Cuello has sculpted other codes in the World of Valon and while this new limited edition is his most ambitious it will take a while for it to catch up with his others which are treasured by players of Flintloque and Slaughterloo all over the world. You can see them on our website and they are 56131 Ludwig Von Barkhoven and 54050 Valon Civilians Set. Nice! We hope you like our last release for this annum and we will have more for you in 2017. 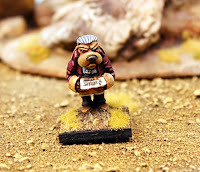 Alternative Armies will continue its release schedule for Flintloque and for High Fantasy too as well as other projects in the works.